Samantha qualified as a dentist in August 1996 from the University of Malaya. Following graduation, she worked in General Dental Practice and in the Maxillofacial Department in hospital. During that time, she was awarded the Fellowship in Dental Surgery of the Royal College of Surgeons of England. She moved to the United Kingdom in 1999 to specialize in orthodontics at Guy's Hospital, London. This led to a Master of Science degree which was awarded by the University of London in 2002. She was also awarded the Membership in Orthodontics from the Royal College of Surgeons of England as well as the Membership in Orthodontics from the Royal College of Surgeons of Edinburgh in 2002. 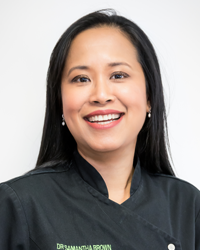 Samantha works as a Specialist Orthodontist in Weybridge and Kingston and has a wide experience in treating both adults and children. She spends a considerable amount of time getting to know each patient as a person, listening to their concerns and discussing their options. She is then able to devise a treatment plan that matches their expectations. She also enjoys working with other dental specialists to give patients the ultimate aesthetic result. Samantha is a certified INCOGNITO (lingual braces) and INVISALIGN practitioner. Her expertise in this field has enabled her to deliver orthodontic treatment to patients using aesthetic and invisible braces. She is currently a member of the British Orthodontic Society (BOS), British Lingual Orthodontic Society (BLOS), European Orthodontic Society (EOS) and the World Federation of Orthodontists (WFO). She is registered as a Specialist in Orthodontics with the General Dental Council (UK). Outside work, she is kept busy by her two lovely daughters, Caroline and Amelia. She enjoys playing the piano and has a keen interest in photography.